And overall look are easy enough to change with different desktop themes. In order to fix dual booting I had to add a stanza to OS12's /boot/grub/menu.lst. Below is a what the last two stanzas look like now. 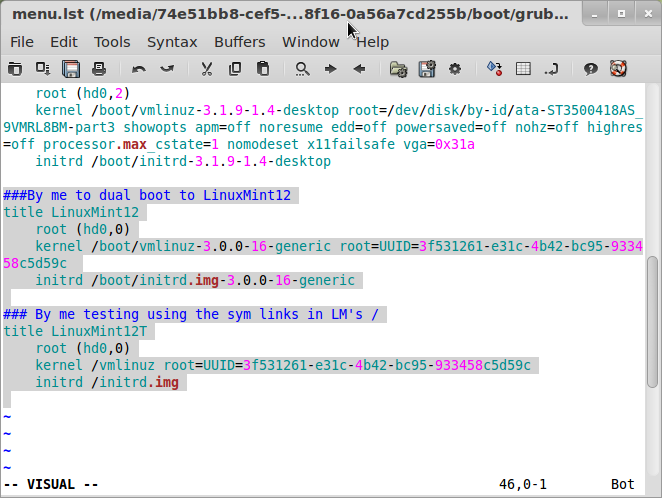 Using the syntax that works for OS12 doesn't work for LinuxMint. Specifically the "/dev/disk/by-id/STRING-part1" part. Also using the LM symbolic links in / didn't work. Do you see the subtle difference in the path in the symbolic links? This means that I have to edit OS12's /boot/grub/menu.lst every time there is a new kernel for LM. I use Gvim to do that task. 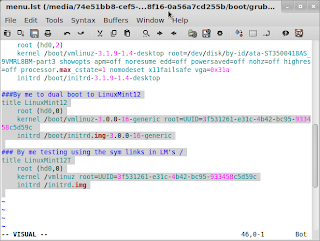 I now have two entries for LinuxMint. Technically I could edit that file on the Opensuse partition and comment out the stanza I don't need but I think that might be risky.